There are tons of photo editors out there, that are based on the web, so that you don't need to download any photo editing software of your own to make that quick edit of your photo. But be warned, because these photo editors are not as powerful as your ordinary desktop image editor, nor is it that faster, but it does serve as a quick option to edit your image on the go, without much complication and also enables easy sharing of the image to many social networking sites. To start with, Picnik is one of the pioneers of online image editing and offers the best functionality too, only to be overtaken by Pixlr. Picnik offers lots of fonts, shapes, image combustibility, etc, whereas Pixlr offers better image control and also somewhat reminds you of the photoshop of the olden days. If you want to somehow seriously edit your image, Pixlr is a must. Photoshop's online version also offeres a decent editor, but is fairly slow and is not even a percent compared to the actual Photoshop, so do go in with high expectations. 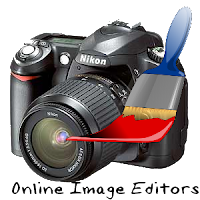 Splashup too offers image editing services, but their interface looks much sleaker and they also offer you an offline app to edit images (not a replacement to professional editors like Paint.NET , Gimp, Photoshop, etc). The web also offers its share of image resizers, but out of the lot, WebResizer deserves a mention because its functionality is to just provide you with tools to resize the image, and offers a lot of customization as that! FotoFlexer is also an online image editor which has a sleek UI, but with a limited number of features. It is a great website if you want to apply effects to your photos, rather than edit them. FlauntR also offers a good set of tools, the only difference being that their web app is written mostly in java script than flash or other services. You do need an account on some of these above mentioned sites to use their editors. Hope this list helped you!